Before you even consider how great a certain school is, you have to know whether you can afford it or not. Will you have to get another job? Will sending your child to this school put unnecessary financial stress on your family? What will you sacrifice to send your child to private school? The national average private school tuition is about $10,302 per year, according to Private School Review, but of course this cost varies drastically depending on the area. For example, the average price of a private school in Iowa is almost $5,000, but over $16,000 in New York. Most private high schools cost more than private elementary schools, as well, so your cost will go up if you keep your child enrolled throughout their school life. 2. What are the hidden costs? 3. How does it compare to the other schools nearby? There must be a reason why you're considering a private school rather than a public one, so make a list of those reasons. Is it because of safety? A particular sport your child plays? Is it because of your religion? Or perhaps because private schools tend to look better on college applications? Once you have those written down, find out all you can about the private school versus the public schools in your area. For example, if safety is a main priority for you, find out how the private school maintains a safer campus than the other schools. What safety protocols do they have in place? How many incidents have there been in the past five years? It's important to dig deeper into these issues because you might discover that behind the high price tag and fancy test scores, the private school you had your eye on isn't much safer or better at getting students accepted to top colleges than you thought. On the other hand, the private school you're interested in might have a huge lead over other schools in athletics or academics, which makes the tuition easier to justify. 4. What will this school do for my child? No one knows your child better than you do, so evaluate potential schools for what they will offer your child. Don't get distracted by impressive stats the school might advertise, like having an unbeatable mathletes team or having the highest number of full college scholarships for basketball players. Make a list of your child's strengths and weaknesses and discover how the school can support both. For example, if your child is naturally talented in theater arts but struggles in math, will this school give him or her unique opportunities to act and learn more about theater? Does the school offer special classes or tutoring to strengthen math skills, or will they be thrown into an advanced math class and expected to stay afloat? School is more than just academics; it's the place where students learn to socialize and create strong friendships. A school that boasts high test scores, but has miserable students is not a healthy environment for anyone. When evaluating the school, ask how the school gets the students involved in their local community. Are the students encouraged to partake in activities that help others outside of the school? You also want to learn how much time is given for breaks and socializing and how often the teachers encourage group projects and working together in the classroom. Most importantly, how does the school deal with bullying and other social behavior issues? 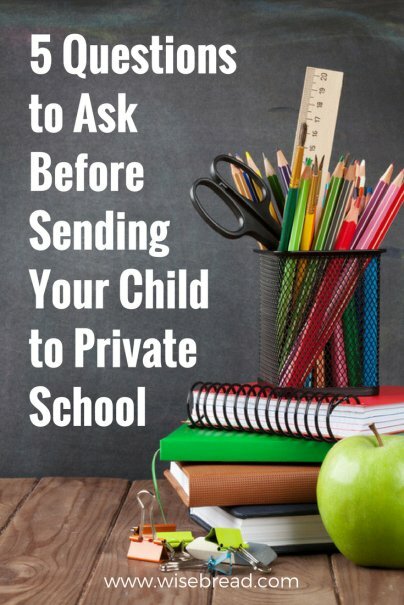 There is truly no right or wrong answer when it comes to choosing a private school or a public school for your child. You know your kid best, and you know what's the best for your family.